When Tom Bilyeu first got his driver’s license, one of the first places he drove to was the local comic book store. Finding fascination in the visual aspect of writing was how his love for storytelling started and during that time he gravitated towards as many comics as he could get his hands on. When he got to college and started meeting other people who had grown up loving comics, he was introduced to the great writers behind the visuals such as Alan Moore and Frank Miller. “I really just fell in love with how deep the medium could be,” Bilyeu said. It wasn’t long before he stumbled across a comic convention in Los Angeles that changed his life. Joe Pantoliano, Carrie-Anne Moss and Keanu Reeves were some of the actors there promoting a movie coming out called The Matrix. They were giving out free tickets to a screening of the film on the backlot of Warner Brothers Studios, and to say attending that event made a massive impact on Bilyeu’s life is an understatement. His long-lasting love for storytelling hasn’t changed, but it definitely took a sharp left turn early on in his career. After film school, Bilyeu wrote a screenplay that ultimately turned into a film – one that left him extremely unhappy with the outcome. It was around that time that he met a couple of entrepreneurs who explained to him the concept of coming into the world with his hand out, and in order to control the art he needed to control the resources. By making money with them, he could easily go back to making films the way he wanted to in no time. Sounds simple, right? Bilyeu thought he would be back on his feet in 18 months. 15 years later, the plan finally worked. They started multiple companies together; the last being Quest Nutrition. Within five years of its inception, it grew to a billion dollar company. Nearly three years ago, he exited the company and started his own with his wife, Lisa. He was finally going to make good on his promise to create the kind of art he wanted to create, so Impact Theory was born. This was finally Bilyeu’s chance to tell stories again, and he knew he had a few options to consider. “I thought we could either just create screenplays, which is a tried and true path, or we could do something that really lets us explore the narrative more deeply, especially visually, and then build an audience which is really the key thing,” he said. 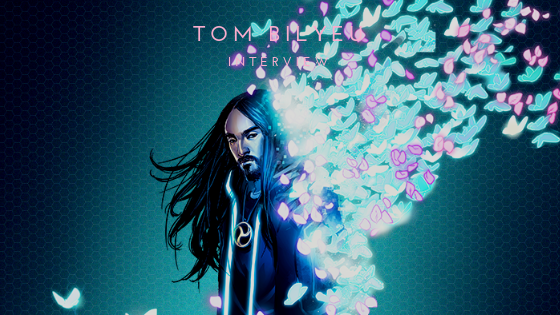 Enter musician Steve Aoki. Bilyeu met Aoki when he interviewed him on his podcast, also titled Impact Theory. When researching him, Bilyeu learned that Aoki planned to be cryogenically frozen when he dies. That sparked the idea of their comic book series, Neon Future. Nearly 20 years after The Matrix was released, it’s not an accident that Impact Theory’s mission statement is ‘to pull people out of the matrix by giving them an empowering mindset.’ Impact Theory was created to impact people on a global scale, which Tom Bilyeu plans to do through storytelling. He’s made his way back to his true passion, and can finally control his art the way he intended it to be.